Emerald City is our latest custom design that has yielded one extra piece up for grabs! 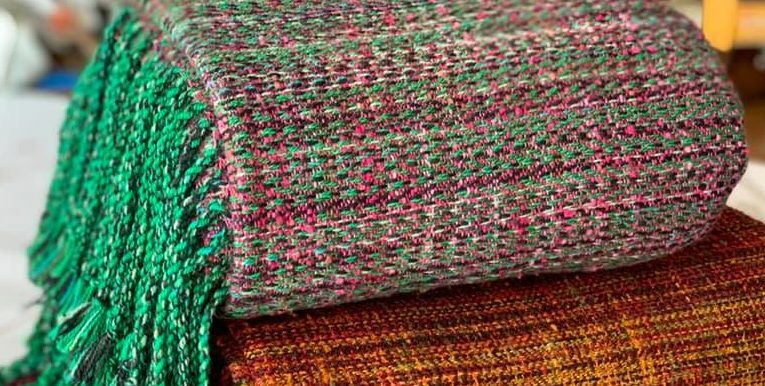 The warp is hand dyed 8/2 cotton in various shades of green, teal and black and this available piece features a hand dyed copper and fuchsia banana silk weft for some incredible contrast. This is a slightly thinner spin of our banana silk that makes for a softer and floppier wrap than previous banana silk wraps, it will snuggle a squish but offers all of the amazing cushy support you’ve come to know for a toddler. The nubby texture of this banana is truly unique with a slight sheen and wool-like cush. This draw will remain open for 24 hrs at which time a winner will be selected at random to receive an invoice via PayPal. As always a payment plan is available upon request!